Looking for a challenging career with a globally expanding company? Atlas offers a wide range of professional opportunities with competitive salaries and comprehensive benefit packages. Take a look at the positions we have available. Atlas Technologies, the world leader in Press Room Automation is seeking an experienced Sales Account Manager to join its winning team. The Sales Account Manager will drive business within an allocated list of accounts and geographic regions. Primary responsibilities include managing our business relationships with established and prospected customers. This includes, identifying and developing potential customers to understand their specific manufacturing needs and where Atlas can assist them with products and services. Effectively communicating new project requirements internally to develop and propose the right, cost-effective solution to the customer. The successful candidate must meet the revenue and profit requirements of Atlas’ business plan, by closing new sales on a consistent basis. Travel will be required. The ideal candidate will have excellent communication and problem solving skills, work well in a team environment and an understanding of technical sales. The candidate should also have at least 7 years of Sales Account Management experience with a strong ability to identify, prospect and qualify new opportunities. Management of complex sales cycles, including mapping of sophisticated accounts, development of high level relationships and account strategies are required. Educational requirements include training in technical sales and marketing usually acquired in four years of college or equivalent. Work experience in the metal forming and/or automation industry and a proven track record of interacting with upper level decision makers is strongly desired. Atlas Technologies is an equal opportunity employer. Atlas Technologies has been a leader in Press Room Automation and Integrations for the past 53 years! We are currently seeking an experienced Mechanical Engineer to join our winning team. The applicant should have excellent communication and problem solving skills, works well in a team environment, while possessing the initiative and skill to take responsibility for a project. The Mechanical Engineer must be able to design, improve, modify, and standardize new and existing automation products. Basic responsibilities include performing AutoCAD design, detail, and checking of manufacturing documents in accordance with specifications as to size, functions, capacities, cost, job schedule, or other requirements. Maintain communication with support personnel, supervisors, and Contract Managers. Participate in design approval meetings as requested by the Product Manager, research data pertinent to the design and maintain reference criteria, coordinate and guide engineering support personnel in preparation of layout drawings, detailing, and stock listing, and responsible for advising supervisor of all pertinent project information on costs, variances, problems, solutions, etc. Other duties include coordinating the creation of manufacturing documents for release and performing other assignments as requested/required. Requirements include advanced training in engineering usually acquired in two to four years of college or equivalent work experience. Bachelors degree preferred. Working knowledge and experience with AutoCAD Mechanical and Inventor 2014. Atlas Technologies, the world leader in Press Room Automation is seeking an experienced and energetic Applications Engineer to join its winning team. The Applications Engineer will create equipment concepts which are simple, reliable, cost effective, and capable of meeting or exceeding customers’ requirements. Create equipment concept drawings and cost estimates using latest computer technologies. Create proposal letters explaining equipment concepts, descriptions, and specifications; customer supplied items/responsibilities, manuals, drawings, try-out and demo, field service, training, shipping, installation pricing, payment terms, delivery schedule, terms and conditions, and warranty. The ideal candidate will have press room automation equipment engineering experience normally acquired in six years. Requires awareness of basic reliability and maintainability concepts. Advanced training/knowledge in electrical and/or mechanical engineering acquired in four years of college or equivalent. Atlas Technologies, the world leader in Press Room Automation is seeking an experienced and energetic Controls Engineer to design new or modified equipment per customer requirements. The Controls Engineer will be required to initiate, design, develop, optimize and problem solve manufacturing processes in a manner that meets safety and performance expectations. The ideal candidate must have sufficient knowledge of controls design to be able to: Create a complete hardware drawing package per customer and company standards, including electrical, hydraulic, or pneumatic components. Must have experience with sizing fuses, wire gauges, contactors, DC power supplies, motor starters, PLC processors, I/O, and enclosures. Must have AB PLC experience, including Control Logix and PLC programming. HMI development, Robotics, servo motion experience is a plus. Basic Qualifications: BS in Electrical Engineering or Electrical Engineering Technology degree from an accredited college or university & a minimum of 2 years of full-time employment experience as a Controls Engineer. Minimum of 4 years of experience in a technical or operational assignment. Working and analytical knowledge of electrical, hydraulic, or pneumatic schematics. Experience with AutoCAD and AutoCAD Electrical. Willingness to travel (10 – 20 %) Experience with Visual Manufacturing a plus. Atlas Technologies, the world leader in Press Room Automation is seeking an experienced and energetic Field Service Technician for the installation, start up and debug of our equipment. The Field Service Technician will also be required to perform repairs on existing equipment at our customers facilities. Must be able to read and interpret electrical, pneumatic, hydraulic, and mechanical prints. Troubleshoot and start up automated equipment of different capabilities, sizes, and requirements. Demonstrate strong PLC skills. Be able to trouble shoot logic and work with controls engineer to solve problems. Train customer personnel in operations, maintenance, and technical skills necessary for proper continuous operation of equipment. The Field Service Technician will also be responsible for startup and adjustments of electrical, pneumatic, and hydraulic equipment for smooth machine operation. AB PLC, Control Logix, PLC programming, HMI development, Robotics, servo motion experience is a plus. Maintain necessary education and training of technical changes. Maintain valid Michigan Driver License. Maintain Passport for International Travel. Minimum of 4 years of experience in a technical or field service assignment with equipment automation. Atlas Technologies has been building creative automation solutions for over 45 years and has installed over $1 Billion dollars in systems worldwide. 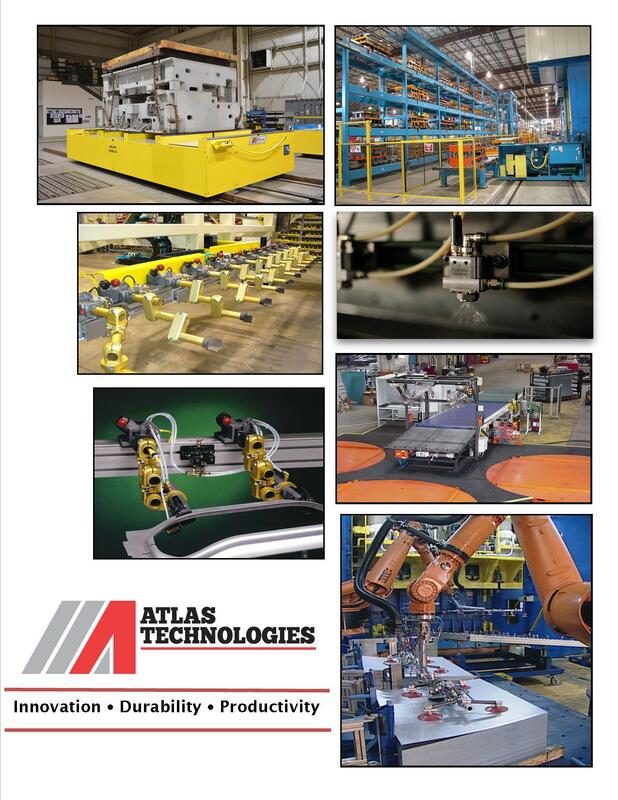 Atlas Technologies strong product offerings include turnkey stamping and fabricating systems, heavy plate and bar steel processing equipment, robotic integration, quick die change equipment, automatic storage and retrieval systems, both conventional and robotic stacking and destacking systems and in-press transfer systems. Instructions Please upload your resume using the "File Upload" link below.